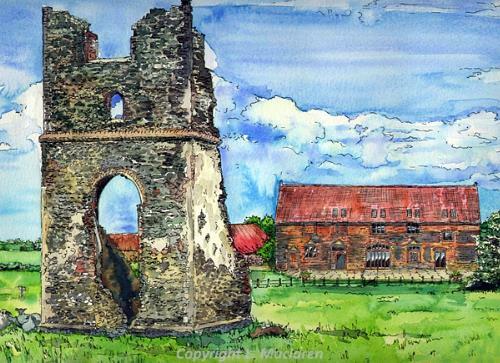 Godwick Great Barn and the ruins of the church/folly of Godwick. This work was instigated from a commission for Architectural drawings from Burns Associates of Swaffham that I did in May 2006. I was shown around the site by a colleague and was fascinated by it's awe inspiring beauty and feeling of age old days gone by. You can still see clearly the outline in bumps and troughs of a medieval village that once was thriving, but now is inhabited by sheep. I understand that it is due to constant sheep farming that it has survived and not been at the mercy of the plough. Hence the importance of sheep in my painting was inspirational too.